If you want to go out for more than an hour or so, what stops you? Chances are, it’s the thought of being able to find- and use- a suitable toilet. To the majority of people who design our town centres, shopping malls, bars, restaurants, cinemas, tourist attractions, a ‘Document M’ wheelchair accessible toilet ticks the box of accessibility provision. I’m sure many of you reading this will think otherwise. 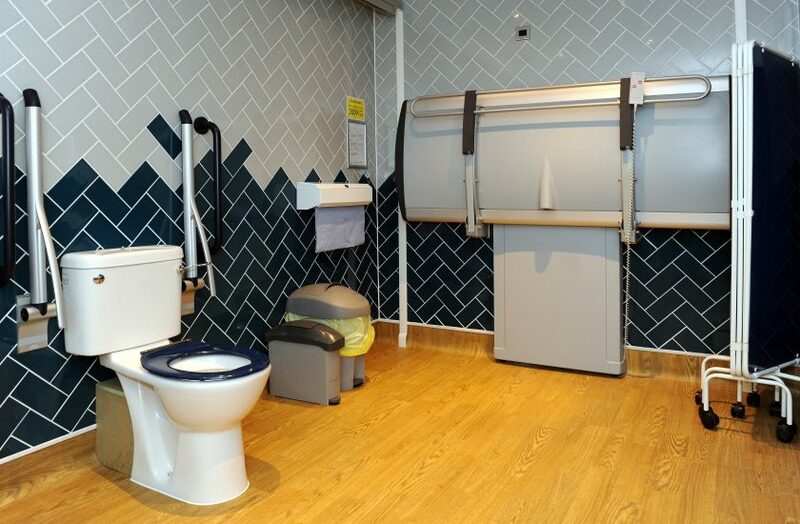 The accepted standard for a wheelchair accessible toilet assumes the wheelchair user can transfer unaided. It assumes you don’t need any help at all. It assumes you are continent. The reality is different. Tens of thousands of people with limitations need extra space for a carer. They need help or lifting to transfer from wheelchair to WC. The carer may need equipment to help them lift. And tens of thousands have continence issues, and may even need changing: more people suffer from incontinence than asthma or diabetes! The solution has been around for a decade. It’s called a Changing Places toilet. Under British Standards (BS8300), such a facility is “desirable” in all buildings to which the public have access; it should be 3m x 4m, and include among other elements a ceiling track hoist, adult sized changing bench and privacy screen. But too few service providers, and potential users, know about them. To date, only 1000 have been opened across the UK. We do our best to spread the message, and encourage their installation, but the best form of promotion is from potential users- you! You know where you’d like to go, but can’t because of lack of suitable toilets. So either contact them, or visit, and explain what a difference it would make. Some venues- such as JD Wetherspoon, Moto, IKEA, most UK airports- “get it”, and do everything possible to resolve the situation. Many don’t, but often because they are not even aware of the issue, nor the solution. Equally, when you visit somewhere, leave a review on MeIncluded, and think about the toilet issue. Were you able to ‘go’ whilst you were there? Did you have to leave, or spend less time than you’d have liked, because there weren’t suitable toilets? Did the provision of suitable toilets mean you COULD go somewhere? Did failure to provide suitable toilets mean you won’t go there again? If it made a difference to you, it’ll make a difference to someone else too.